Are you enjoying the warm weather? I’ve been dying, and it’s not even to the hot months yet lol. I used to love summer, but my bf is pulling me to the dark side. He would live in an igloo in the freezing cold all year if he could. Well, as long as he could still have his internet. While I am not that extreme, I admit I am already missing my sweatshirt weather. One nice part about this time of year though… going to the beach! Doesn’t matter if soaking up sun, or splashing in the waves. Always a good time, and can never get enough. Even I, who admits not to loving summer as much as everyone else, would practically live at the beach if I could. I have a friend, a few of them actually, that are almost obsessive about the water. The ocean specifically. Not that I can blame them, it’s a beautiful place. Everything from the scenery to the animals that call it their home. 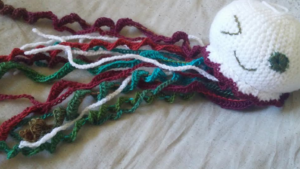 ‏♦ Yarn – you can make your jellyfish any color you want, recommend at least two different colors. 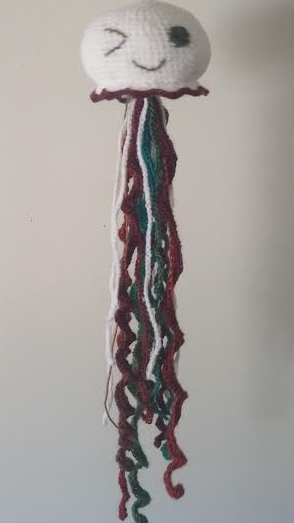 I used white for the body, and a multicolored yarn for the tendrils. This pattern is written in rows. 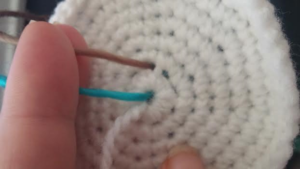 When the pattern says 5sc, this mean 1 single crochet into the next 5 stitches. At the end of each row you will slst to end the row, and then chain one so you can start the next. I create all parts, and then sew them together at the end. If a piece should have a long tail in order to sew, it will be specified. Any other tails should be tucked in. 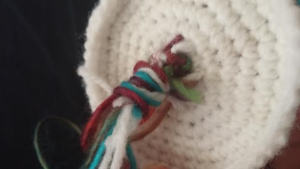 With white yarn (or whatever color you want the head to be) make a magic ring. 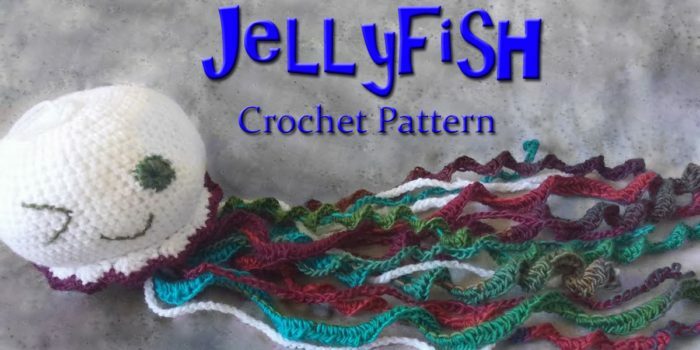 Keep a long tail on the end, can turn this into a loop to hang your jellyfish. 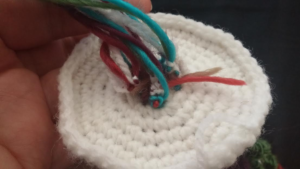 With the same color yarn, make a magic ring. This is not an exact pattern, get to kind of play around a bit. I actually really enjoyed making these, they are just so cute! What you’re going to do is make a chain, each one ranging between 35 and 70. Most of mine ranged in the 50-60 chains, with a few that will hang shorter or longer. There are four different styles of spirals that I used, each very similar but each giving a bit of a different look. The only difference in how they are made is how many stitches in each chain, and what kind of stitch. 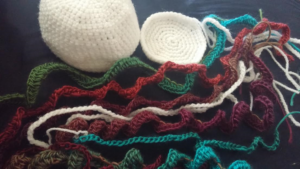 The thicker tendrils are done with half double crochets, while the thinner ones are single crochets. The tighter curls are 3 stitches in each chain, and the looser ones are 2 stitches in each chain. – sc into the 2nd chain from the hook. sc once (or twice) more into that chain. 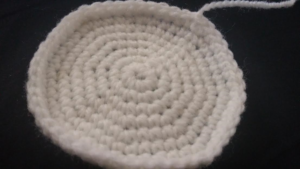 – crochet 2 (or 3) sc’s into each chain. – when finished tie off, leave a long tail for connecting. – hdc into the 3rd chain from the hook. hdc once (or twice) more into that chain. 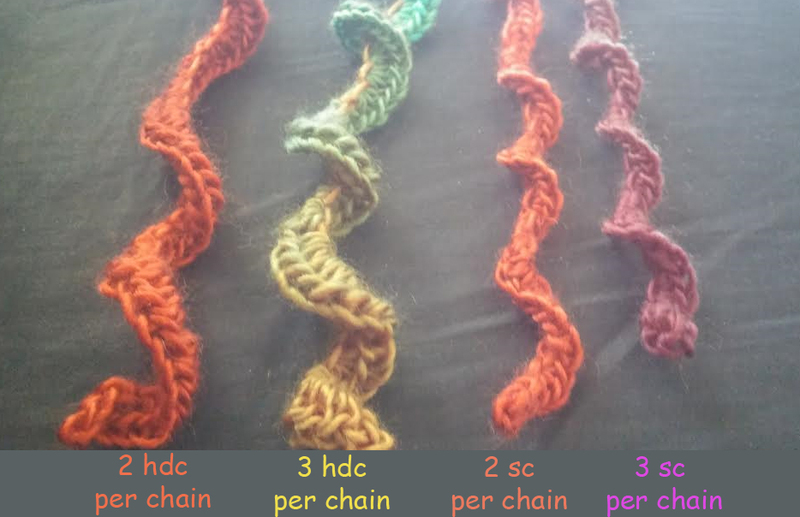 – crochet 2 (or 3) hdc’s into each chain. I don’t switch styles while making my tendrils, but if you want a bit of a messier look feel free to experiment with that! Make a couple of each style, how many you make depends on how full you want it to look. 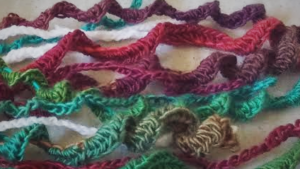 The last thing to make before you start your assembly is a couple chains out of the same color you used for the body, as well as the color you used for the tendrils. Again, want these to be at different lengths, so stick with the 35-70 chain range. Do not make these into spirals, leave them as chains! To start, if you want to give your jellyfish a little loop to dangle from, now is the time to do it. I didn’t do anything fancy, just took the tail I left from my magic ring and fashioned it into a loop. Attach it to the top of the head on the opposite side that it started from. Now, gather all your spiral tendrils, and prepare to do a lot of tying! 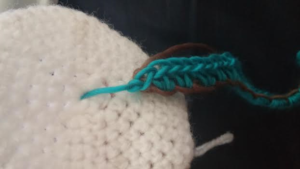 Find the center of the bottom panel for the head and pull the long tail that was left on the tendril through it, leaving the pretty spiral on the right side. Take another tendril, and pull its tail through a space near the first one. Tie the two tails together, make sure it’s secure! Don’t worry about making the knots pretty, this won’t be visible when we are finished. I continued working my way out from the center, grabbing the spiral tendrils at random and tying them together. Once all the spirals done, do the same thing with the ones that are left as chains. These we want to be around the outer part of the spirals, that’s why we saved them for now. Once all the tendrils are attached, I tied one giant knot with all the tails, making sure they are extra secure. 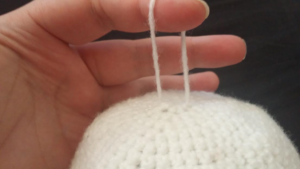 I know this is the assembly part of the pattern, which normally means sewing everything together, but in this instance it means a bit more crocheting. 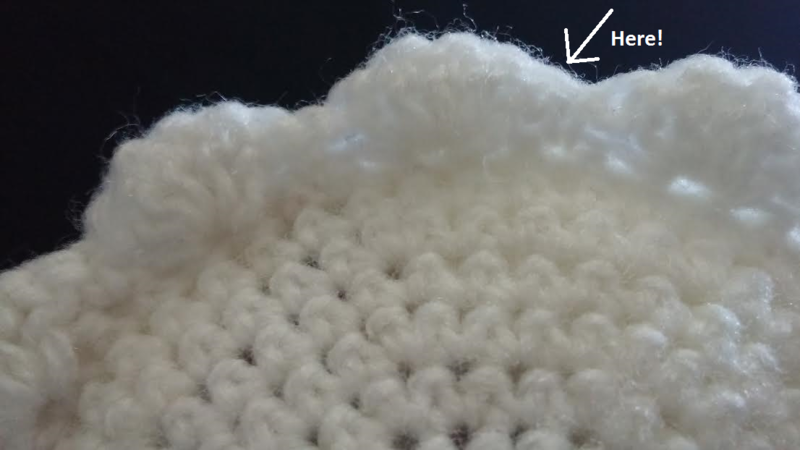 To attach the top and bottom part of the head, simply single crochet the two together. 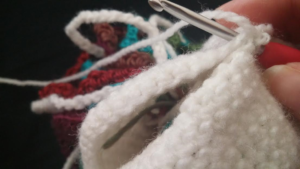 There is no front or back, so just attach your yarn and single crochet around. 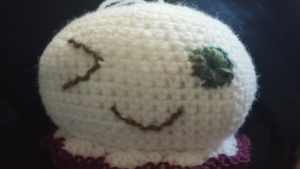 Stuff the head firmly as you crochet, do not tie off! When done will have this nice line that we can work with. 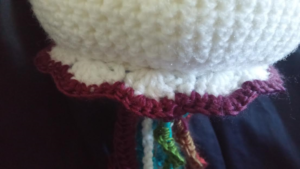 The last step is to make the nice wavy edge of your jellyfish’s head. 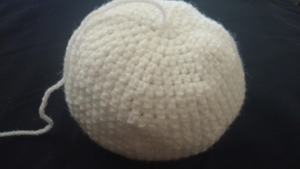 With the same yarn you used for the head, chain 1. 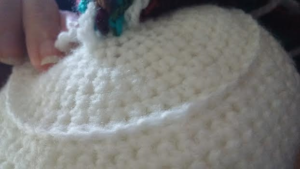 1 sc, skip next stitch, 5dc in next stitch, skip next stitch. Repeat this around, slst to close. Tie off and tuck in tail. 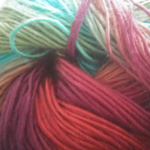 Attach the color yarn you used for the tendrils onto the first double crochet. Chain 1 to start. 2sc, 3sc into next stitch, 2sc, skip next stitch. Repeat around, slst to close. Tie off and tuck in tail! This last step is optional, but who doesn’t want to have a cute face on their jellyfish? 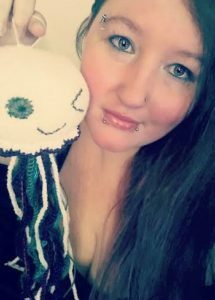 I embroidered a face on mine with the same yarn I used for the tendrils. If don’t want to embroider, then you can always cut out a face from a felt sheet and glue it in place. 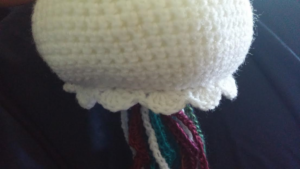 Now you have an adorable jellyfish that will keep you company through the summer, and will remind you of warmer days once winter returns.